A seal which appears to have been shot. A marine conservation charity has been patrolling stretches of the Northumberland coastline this week after ‘shot’ seals have been discovered on numerous beaches. Members of the Sea Shepherd UK crew were out around Alnmouth, Embleton and Bamburgh on Monday. It comes after a number of reports over the last few months relating to seals which have been found in these areas with apparent gunshot wounds. 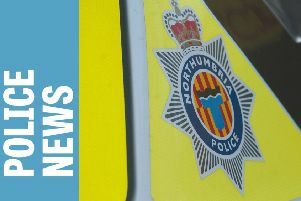 A Northumbria Police spokesman confirmed that a number of reports of seals being found with gun-shot injuries had been received, but no criminal act has been found. He added: “We work with partner agencies and members of the community to gather information and intelligence about any activity that adversely affects wildlife and the environment. Fishermen are allowed by law to shoot any seals that are attacking their nets. Ned Clark, chairman of the North East branch of the National Federation of Fishermen’s Organisations, said fisherman can apply for a licence to shoot seals, as well as whales and sharks. But he said it was ‘rare’ for fishermen to shoot seals and most would use bangers or something similar to spook the animals so they keep away. The removal of animal carcasses from beaches between Seaton Sluice up to Amble is the responsibility of Northumberland County Council. A spokeswoman said the authority had removed ‘less than’ 10 seals – which had been either deliberately killed or died through natural causes – along that stretch this year. She said responsibility north of Amble depends on the land ownership. l The Environment Agency is urging people to report illegal fishing by calling 0800 807060. It comes after three men were arrested on suspicion of salmon poaching at Hagg Bank, near Wylam, last week.